Teams must register by May 1 and submit a tentative roster and full payment at the time of registration. There will be a captain's meeting prior to the start of the season which runs May 10th - August 2nd. A minimum of 10 one-hour games will be played with a season ending tournament on Friday evenings at the Byron Sports Complex. The fee is $650 per team and the team Roster/Waiver Form is due prior to the first game. These competitive leagues for 8-14 year olds continue to build upon fundamentals while playing both home and away games against teams from surrounding communities such as Ashton, Dixon, Forreston, Oregon, Polo, and Stillman Valley. Players register as individuals and teams are formed through a draft process. There are no team/player requests allowed in these leagues. 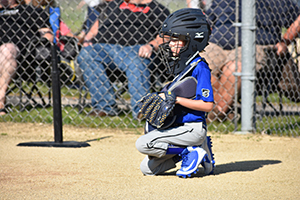 This instructional league for 4-6 year olds teaches the basic fundamentals of hitting, fielding and throwing in a non-competitive game environment. Practices are held once a week at the coaches discretion and games will be played on Tuesday evenings at the Byron Sports Complex. All players will receive a jersey and a medal. Volunteer coaches are always needed, so if you are interested please indicate it on your child's registration form. Participants must sign up by April 29th to be guaranteed a spot in the program. 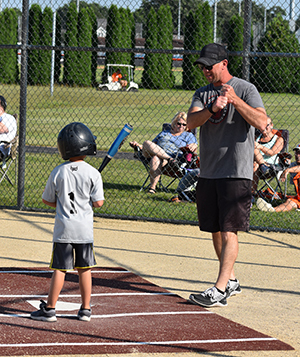 This instructional league for 6-8 year olds builds upon the basic hitting, fielding, and throwing fundamentals taught in t-ball and serves as a progressive step between t-ball and baseball. Players will play multiple positions and learn the rules of the game. The league will have a non-competitive regular season schedule and end with a competitive season ending tournament. Practices are held once per week and games will be played at the Byron Sports Complex. All players receive a jersey and medal. *All youth players grow and develop at different rates. For this reason, we allow parents of 6 & 8 year olds to choose which league they fit best in. Generally, players should play at least one year of T-Ball before moving to Coach Pitch, and two years of Coach Pitch before moving to the Minor League. If you are unsure of which league to put your child in, please contact Nick Warrner at 815-234-6218 or nwarrner@byronparks.org. New this year! Join Byron High School varsity coach Dale Hartman for this exciting instructional baseball camp for youth, grades 3-5 & 6-8. Whether you want to perfect your swing or you are looking for basic instruction this is the camp for you! Camp will be held June 3-6 and times vary by grade. Please register by May 22nd to guarantee your spot in the program.